Posted July 19th, 2018 | Blog. When it comes to creating compliant buildings, specifiers working in the social housing sector face various and numerous challenges but working with a specialist supplier like Soundcraft can bring numerous benefits. Posted July 19th, 2018 | Windows. Posted July 17th, 2018 | Fire doors. Working alongside Allied Protection, part of the Lakehouse Group, Soundcraft has played a key role in improving the fire safety standards as part of the refurbishment of an eight-storey residential block of flats in Catford, Greater London. Posted June 19th, 2018 | Fire doors, News, Regulations. 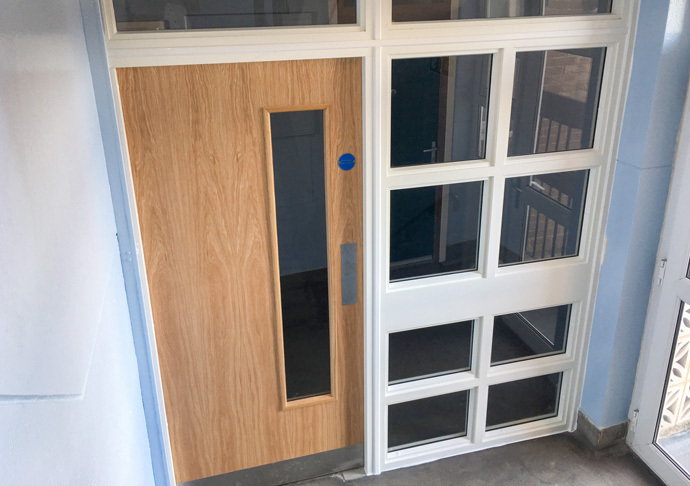 After successfully completing the delivery of new fire doors and screens to the communal stairwell areas, Soundcraft is returning to the Thamesmead Estate in South London to commence a second phase of works. Soundcraft step up for charity! Posted May 11th, 2018 | News. Members of the Soundcraft team will be putting their best foot forward on Sunday May 27th, as they take part in a challenging charity walk in the capital to raise vital funds to help enrich the lives of children with disabilities and serious illness. Posted May 9th, 2018 | News. As part of Soundcraft’s continuing investment in the development our in-house services, several members of our team have successfully undertaken two new training courses in the design and installation of windows, doors and curtain walling. Posted May 6th, 2018 | Blog. With the need to provide specifiers with a quality choice of doors, windows and curtain wall systems that perform as well as they look, the added value that the supply chain can offer can’t be underestimated. In our latest blog, Soundcraft’s director of production Lee Gordon looks at the external benefits of working with a company with in-house expertise. What glazing options are available for timber Portcullis doors and screens? Posted May 4th, 2018 | Security Doors. Glazed panels play an important role in security doors. On its own, a panel designed for security purposes does not make a door secure – but it contributes to the performance of the product as a whole. Glazing may be seen as a ‘weak spot’, but it provides much-needed visibility for occupants and building users that can aid their security. What are the key features of timber Portcullis doors and screens? When it comes to doors designed for security, particularly communal security doors, a Secured by Design (SBD) accreditation is instantly recognisable – and the marketplace generally wants SBD-standard doors made from steel or aluminium. When should Portcullis timber doors be specified? Communal security doors welcome people to a building but are also the first line of defence against anti-social behaviour. Achieving the right specification so residents enjoy being secure in their homes without feeling prisoner is a delicate balance.